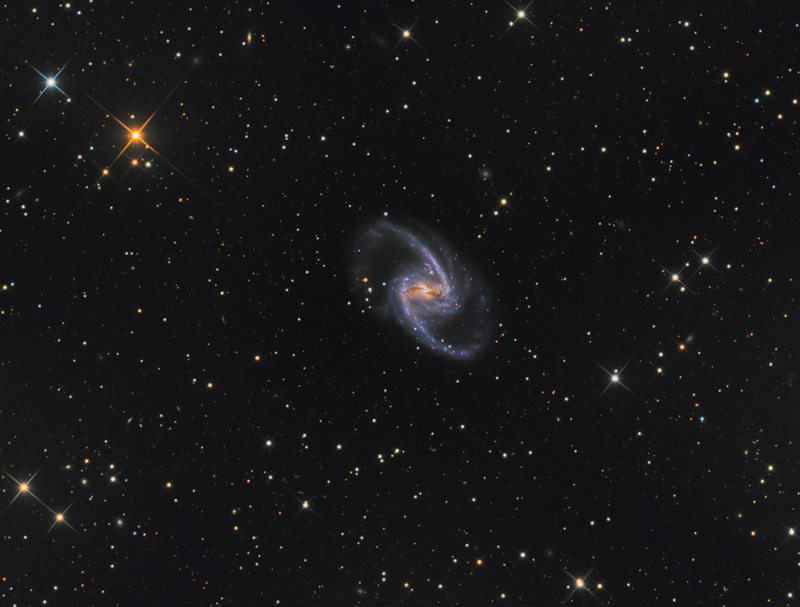 NGC 1365 is a barred spiral galaxy in the constellation Fornax. 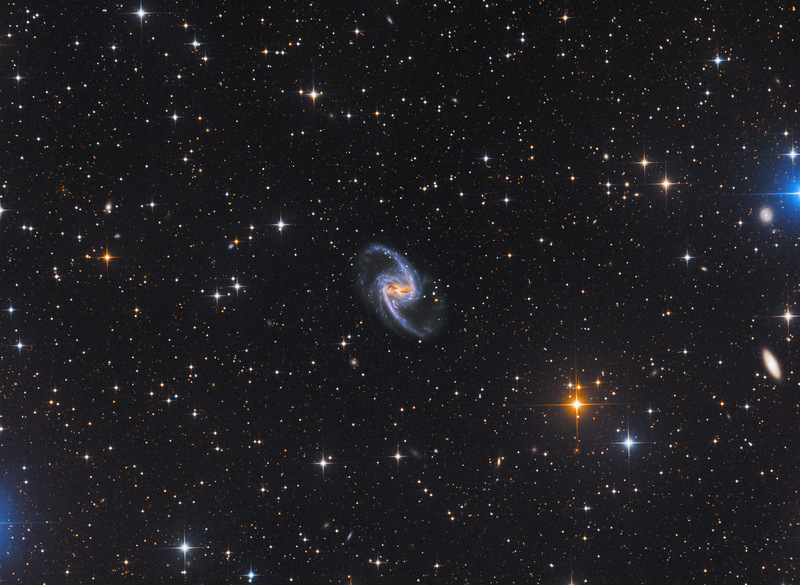 It is about 60 million light-years away and is a member of the Fornax cluster of galaxies. NGC 1365 is a type 2 Seyfert galaxy. As seen from Earth, it rotates clockwise and a complete revolution takes about 350 million years. 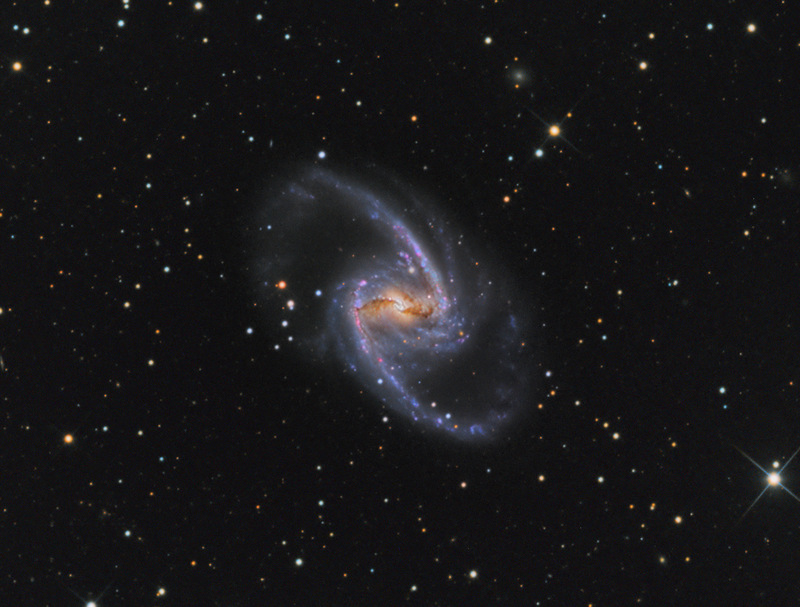 NGC 1365 has a brightness of +9.5 mag and an angular size of 11 x 6 arcmin. Its real size is about 200 000 l.y. which makes it one of the biggest known galaxies. As with most of the spiral galaxies, there is a black hole in the center of NGC 1365. By a happy coincidence (a gas cloud is situated on the line of sight between the Earth and the center of the galaxy), the diameter of the X-ray emitting gas disk around the black hole could be measured recently by space-based X-ray telescope Chandra. According to the measurement, the gas disk has a diameter of 7 AE, which represents only ten times the calculated event horizon. In NGC 1365 have been observed four supernovae : SN 1957C (type unknown), SN 1983V (type Ic), SN 2001du (Type II-P) SN and 2012fr (type Ia). At the rightmost position can be seen the beautiful rendition of our great friend and renowned astroimager Warren A. Keller. Thanks Warren for the fantastic job! Total Exposure Time - 150 min.